Story Buddy | Mrs. Anton's Class! Today we worked on finishing up our books. We had some pages that needed to be tweaked! I have uploaded all the books to the Pictello server and made PDF copies of all the books that were created. After our Show and Tell Day I will email these to each family that would like a permanent record of their child’s work. Our books have four pages in them. Each page represents a project. Each project explored different concepts and provided a variety of learning opportunities. The books themselves take only a minute or two to view but they represent hours of learning. 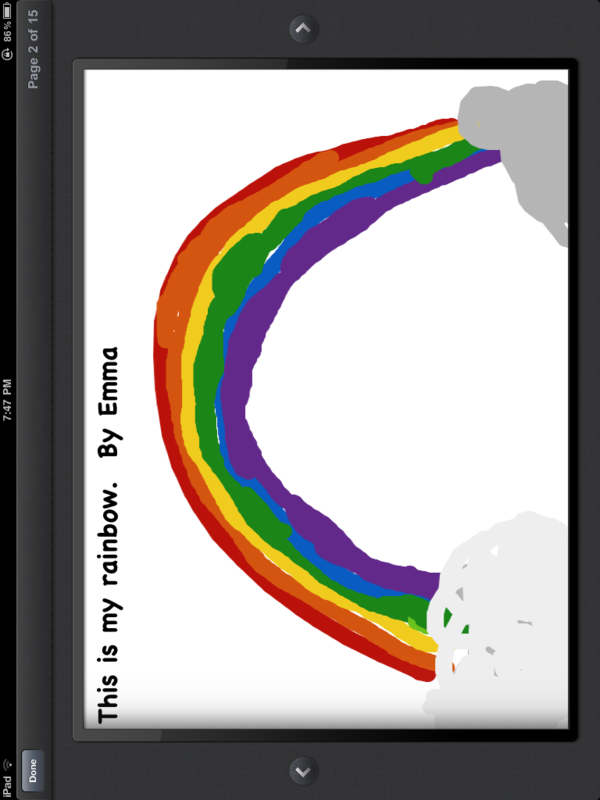 I think that the children really liked creating their projects on the iPads and are eager to share their efforts. I am very, very, very proud of the work they did!! And the best part is that they had a really good time doing it! I bet they didn’t even realize that they were learning! We are also sadly finishing up the time we have with this project. We have had the iPads for five weeks. I wish we could have them forever….. They are moving on to the next lucky group of students and teachers next week. We will have our final day with them next Friday. They have been an absolutely fabulous addition to our classroom and our learning. Boy, will we miss them! Today we continued to explore and learn using the iPads in our classroom. We used the iPads as a workspace to work on spelling simple long vowel words. We have been working on the long vowel rule “When two vowels go walking the first one does the talking and he says his alphabet name.” They all jumped in and enjoyed using the ipads this way. We saved a lot of paper too! We are trying to become more familiar with Story Buddy. In particular, we are trying to use the text element to write our own stories. In the morning the children drew snowmen and then on a different page or on the same page tried to write a story about their snowmen. Learning how to write using a keyboard is one thing. Learning how to correct your work is another. It is a little tricky to manage the “select” and “cut” options as well as using capitals and periods. I wish that there were at least 4 Mrs. Antons to help! We managed though! Miss W. helped too! 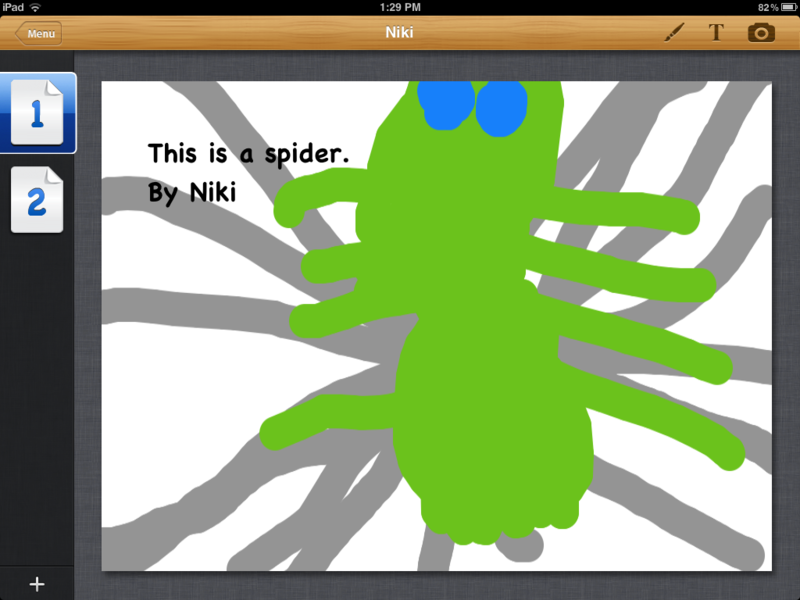 In the afternoon, we tried to write a journal entry about the iPads using Story Buddy. Part of the process is finding the app, opening it, learning how to create a new book, name it, create some pages, and choosing the correct tool, font, and so on. That’s a lot for little ones to grasp even before they start their work. But they constantly amaze me by jumping right in and getting it done! I was very happy to see them trying to write their own sentences in addition to the frame sentences I provided for them. 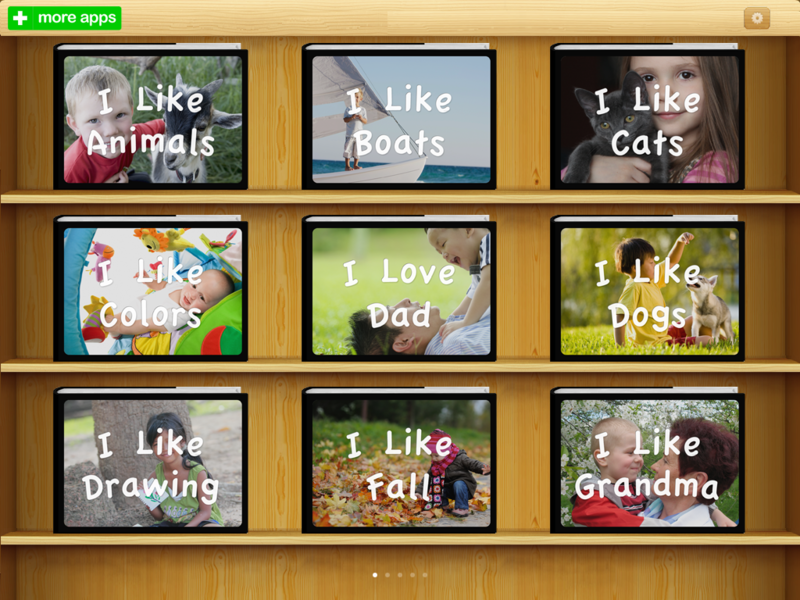 The really cool change they made was changing the “I like the iPads” frame to an “I love the iPads” frame! 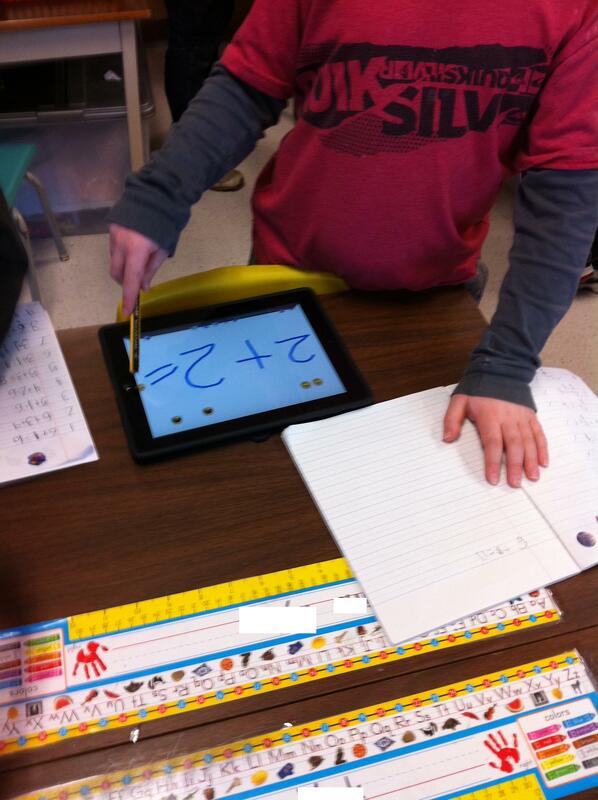 We also did some math using the iPads and the app Doodle Buddy! They had to create a math story using the stamps and then go around and record all their friends stories in their math scribblers. The stamps in Doodle Buddy have a sound attached to them when you use them. It is fun to listen to all the giggles from the children as they make their stories. We also used the iPads for Silent Reading time! They were able to use the I Like Books app once again to find a story that they wanted to listen to or try to read by themselves. The day just flew by! On Friday we continued our exploration of the iPads. We started with a chance to practise our Dolch words using the Sight Word Bingo app again. I have to admit that it was really fun to see a student pump the air with happiness when he got a Bingo! It is a really neat app because I can encourage the children to practise the Dolch word list tailored to their current individual needs! Later on in the day we worked with an app called I Like Books. It has a lot of books on a variety of topics. 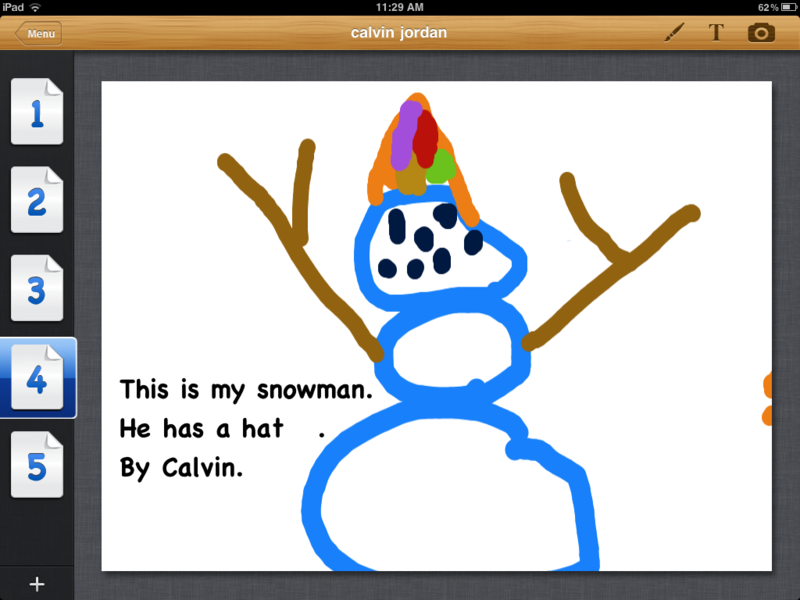 After introducing the app I let the children choose and explore to find the story they wanted to read. They can choose to read the story themselves, have it read to them as they “turn the pages ” or let the app read and turn the pages for them. Once again, nice to see students choosing books that appealed to their particular interest. To complete our exploration for the day, we worked with Story Buddy again. 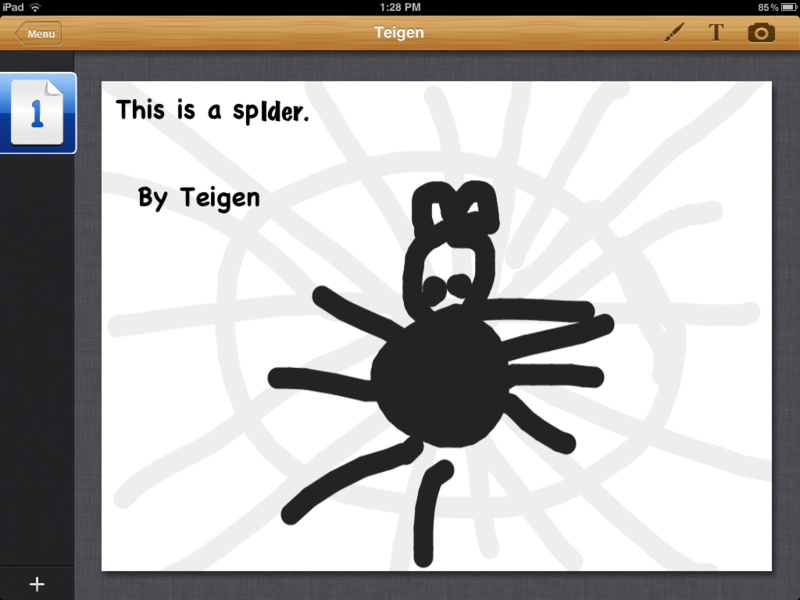 On the second visit, it became clear that the children were getting quite comfortable with this app. 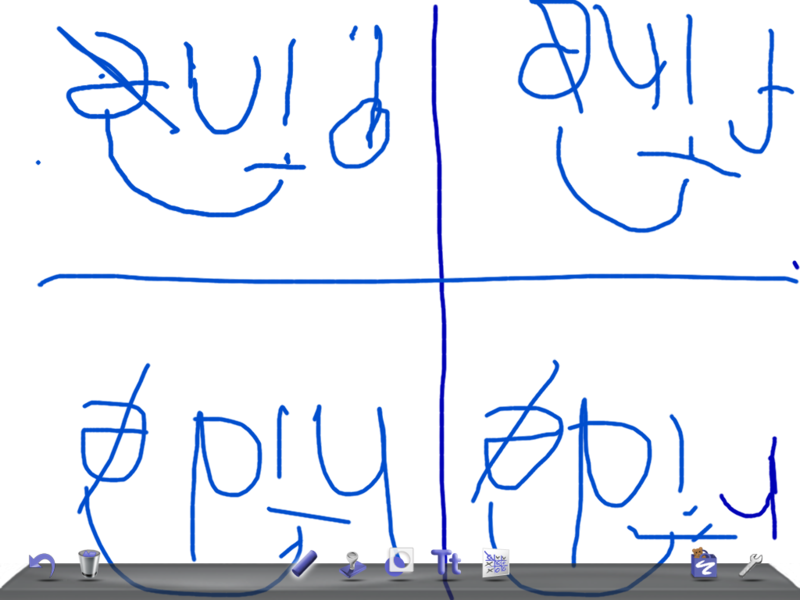 The children drew pictures and then using the text function they were able to add a comment to their picture using a sentence frame copied from the board. I love that the children are producing such vivid illustrations with lots of detail and it is fun to hear them talk about adding “text”. Welcome to our class! We hope that you find the pages and information useful! We are playing around with technology and learning as we go along. We are getting really excited about the iPads that are coming to our classroom this week. I have been bringing my own personal one to school and having the children use it for a variety of projects. The children really love it and have NO FEAR! They just jump in! 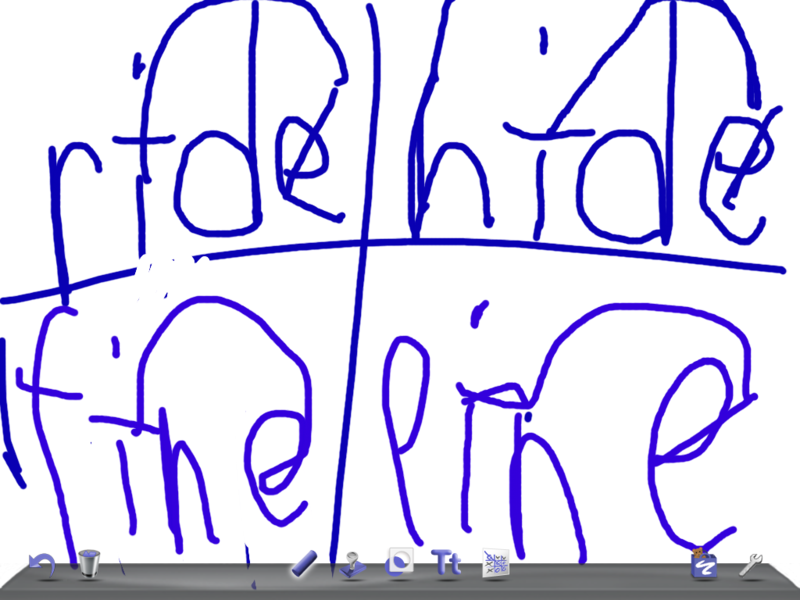 I have had them experiment with StoryBuddy and Sight Word Bingo. Both are big hits. 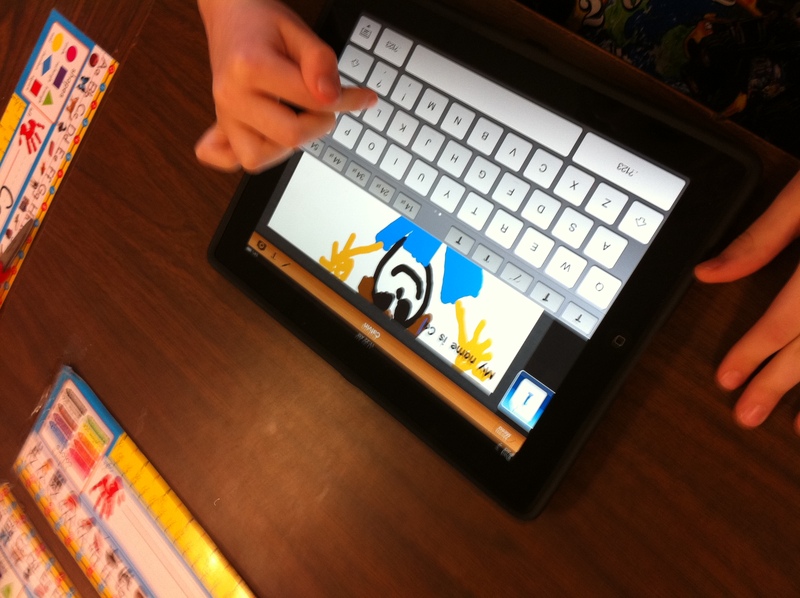 StoryBuddy lets them draw a picture and write a simple sentence to go with their illustration. I then take a picture with the iPad and add it to the next page. 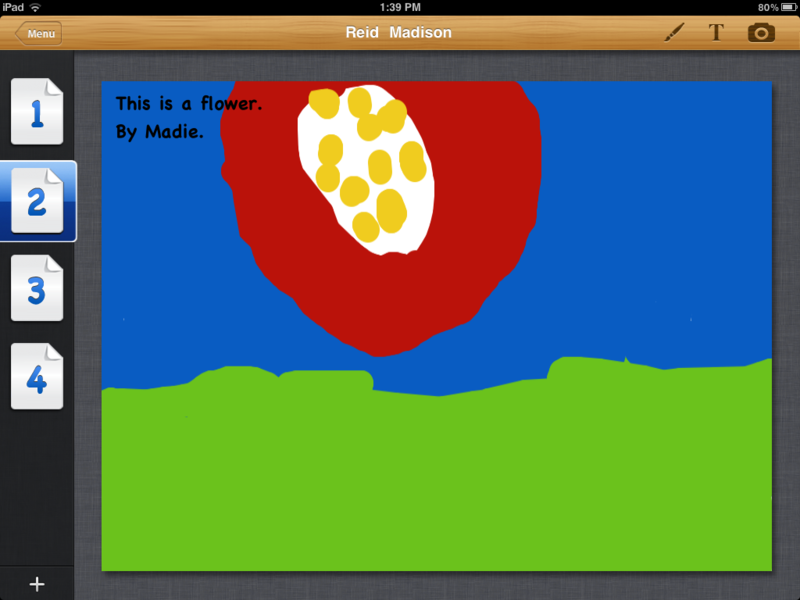 I love the vivid colours and the details that the children have added. They seem very willing to take the time to do a Big Bright and Beautiful picture (the Three B’s of picture making) using the iPad. Sight Word Bingo is an app I loaded that allows the student to practise the list that they are working on with a variety of games. Two children play together. They are doing a really good job taking turns!! 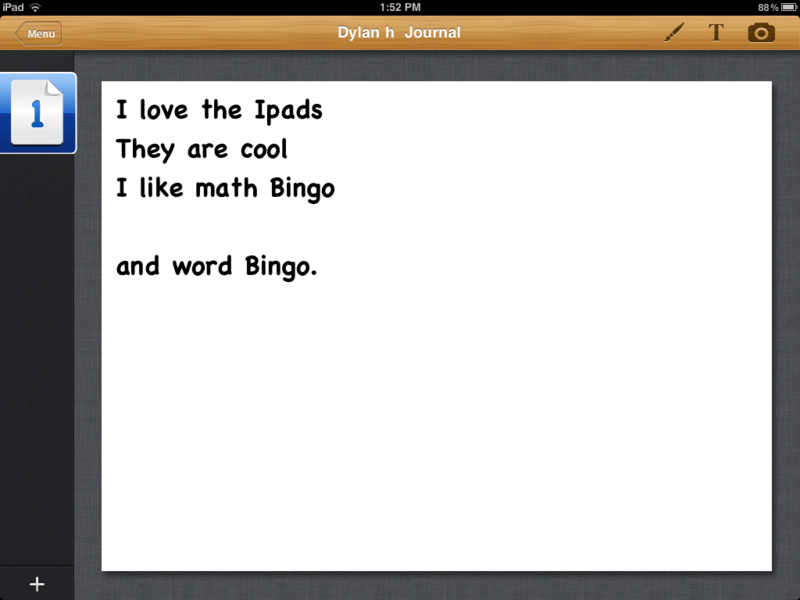 Even one iPad really helps so I am really pumped to see what 15 iPads will produce!